A little while ago, and on the Facebook grapevine, I heard that a new vegan beauty parlour had opened in Colchester, Essex, and as you can probably all imagine I was really curious to find out more. Essex is pretty sparse to say the least when it comes to vegan friendly hair and beauty salons and it's not something I ever see advertised locally so this really did catch my eye. This is also another reason why I can't bring myself to leave Facebook (as much as i'd like to) as i'd definitely miss out on finding out about things like this! I was so happy when The Garden of Eden Beauty owner Dionne Bartlett contacted me out of the blue to see if I wanted to visit the salon to try out one of her treatments. Of course I was quick to say yes and I was excited to experience the salon for myself. 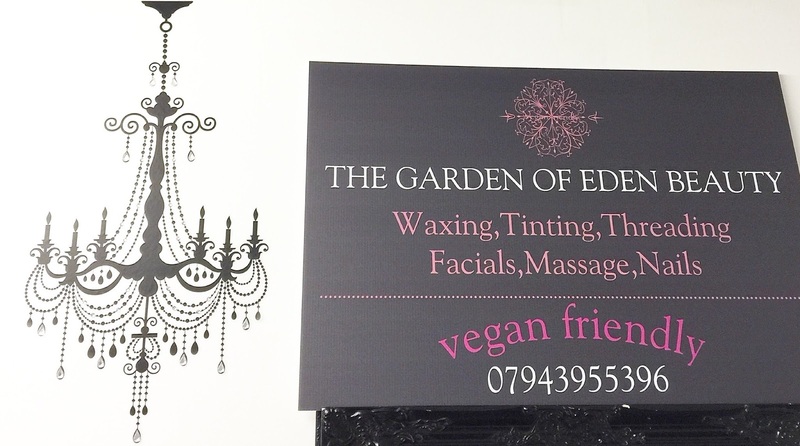 The Garden of Eden Beauty is in fact located in the same space as the Lucky Rose Clinic who also happen to specialise in vegan friendly tattoos and permanent makeup. Once inside the clinic it was really great to see that these small vegan friendly businesses have combined forces to offer something quite original - a one stop shop for all of your cruelty free and vegan beauty needs! There's even a resident hair stylist who uses all vegan friendly products. It's hard to believe this exists let alone it existing in Essex. Time really are changing! Dionne showed me around her beauty salon whilst also filling me in on more about herself. As a long time vegan herself she really understands the importance of using cruelty free and vegan friendly beauty products but it wasn't her initial intention promote her business as being 'vegan'. Dionne happened to see a request on Facebook for a vegan friendly manicure and she soon realised that this is in fact a great selling point and something which sets her apart from all the others. With the rise of Veganism in Essex, and particularly Colchester which has recently seen numerous vegan friendly cafe's open, the word 'vegan' has definitely become a big selling point. And it's definitely paid off as Dionne has been inundated with bookings so far and business is going well which is great to hear. Dionne offers a wide range of beauty treatments including facials, gel manicures & pedicures, Jamberry nail wraps, eyelash tinting & extensions and aromatherapy massages. I opted to try out a hydrating facial as my skin felt quite dry following my recent holiday to Ibiza and where it had seen a lot of sunshine. This facial lasts 35 minutes and is priced at £35. It's designed to nourish and hydrate dry to normal skin leaving it feeling plumper and glowing. Dionne uses products by a brand called Kaeso who use only naturally derived ingredients. They are of course also vegan friendly and cruelty free! The facial itself was such an enjoyable experience and so relaxing. I never usually opt for facials as it always seems like too much hassle to have all my makeup removed and to then have to walk around in public bare faced! So this really did feel like a special treat. As Dionne worked her magic on me it felt so comforting to be in the hands of a fellow vegan. She made me feel so at ease, we chatted about vegan living and the whole time I could rest safe in the knowledge that the products being used were all animal friendly. I felt sad once the treatment had ended as I could have easily continued to lay there for another half an hour at least. My skin also looked amazingly brighter and firmer. I was impressed! As well as treatments Dionne also offers gift vouchers for her services which I think is an excellent idea as I know of a few people who I could spoil with a pamper treatment for their birthday. It also gives me another idea for what to ask for for my own birthday! She also hosts occasional vegan social and promotional events at the salon so be sure to like her Facebook page to stay up to date with all the goings on. Next time my hair is due for a re-vamp I am definitely going to book myself in with the stylist here. I took a few minutes to explore the hairdressing area and I was interested to find these Maria Nila hair products which I have to say are completely knew to me and i'd never heard of them before. It was great to see that they are both Leaping Bunny and Vegan Society registered so i'm really excited to see what they can do for my hair in future. I love discovering new vegan friendly products! I really enjoyed my experience at The Garden of Eden Beauty and I left feeling so relaxed and with much brighter skin! I often don't really enjoy the experience of visiting hair or beauty salons as it can at times feel a little intimidating but I'm pleased to say that I didn't get that feeling at all here. Instead it has a really lovely laid-back atmosphere and all the ladies I met were very friendly and welcoming. There was no pretentiousness at all and I felt very at home which I think is so important when having treatments of any kind carried out on you. I personally can't wait for my return visit and it's so great to know that somewhere like this exists. I now have a one stop shop for all of my hair and beauty needs and the best part of all is that I can be confident that no animal has had to suffer for me to look and feel good! I would definitely recommend a visit and it would be great if all of the Essex vegans could show this brilliant small business some support. Have you experienced The Garden of Eden Beauty yet? To make a booking just call 07943 955 396 & don't forget to mention my blog! * The treatment received in this blog post was in return for a blog review. All views and options expressed within this post are completely my own. Beauty Planet is a specialized beauty salon design company located in London provides a very prepared planning method which will help hair stylists for top level design for cosmetic salons. That's a perfect beauty salon for all type of treatment, It is really best for me I always visit salon to maintain my beauty to take skin treatment. Find the best full time Beauty Salon Headingley service which make you more beautiful. If you are looking at booking some beauty treatments ahead of your wedding, you will probably be doing so in order to look your best for the big day.